I’ve had the pleasure of knowing and working with Tahira Afridi, director at Zardozi (now called Artisan Links)– Markets for Afghan Artisans in Pakistan, for well over 8 years now. During that time, I’ve worked with her on a variety of design and development projects as a way to create market opportunities and buyer linkages for the beautiful embroidery produced by the women who make up this enterprise. 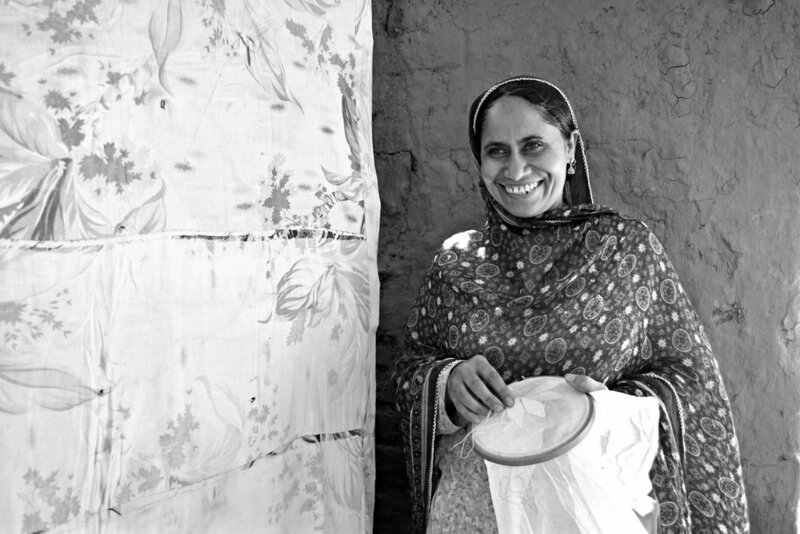 Zardozi works with hundreds of refugee artisans throughout Pakistan and will soon be working in Jalabad, Afghanistan. Earlier this year, the NGO partnered with textile designer Jacky Garretsen to develop a line of wall décor that beautifully showcases the level of craftsmanship these women are capable of. From table linens to pillows to stockings, they can do it all. If you’re a wholesaler or retailer and would like me to make an introduction to this talented group, please let me know. They’re set up to develop custom designs, with reasonable minimums. It would be my pleasure to help expand their buyer connections as they currently have limited access to market. 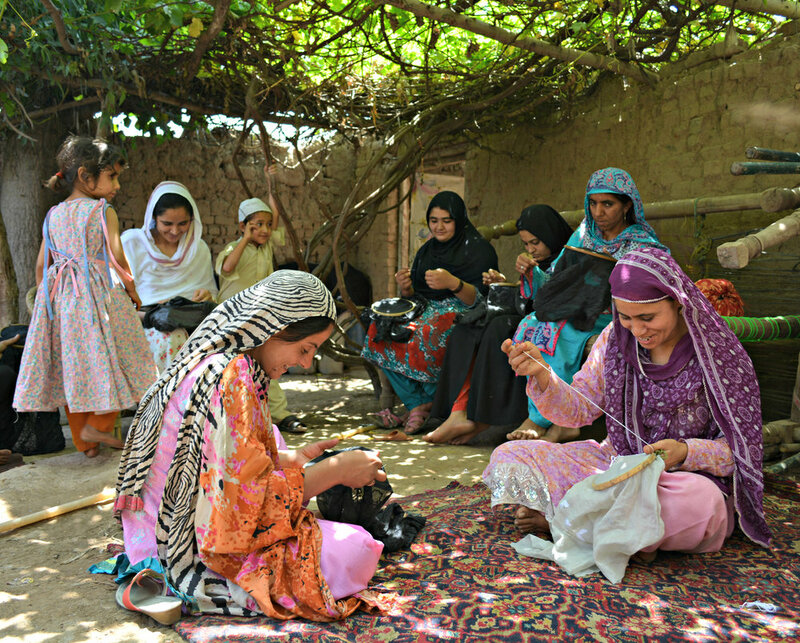 Tahira was nice enough to take the time to share more about her work and the women behind Zardozi’s products. These embroidered pieces are made in a town called Mansera in the Khayber Pakhtunwa province of Pakistan by Afghan refugee women. All of them work from home. Artisan Links has a mobile team who visit them regularly to give them work and later collect it. The semi-finished pieces they create are brought back to the main office in Peshawar city where another group of Afghan refugees stitch them into finished products. Is embroidery work still a part of the women’s everyday lives? Hand embroidery work is slowly dying out as machine embroidery takes over. Artisan Links aims to keep this art alive. By giving them orders of embroidery pieces we’re doing just that. But there are still many women who embroider their home furnishings (runners, pillows, dresses, etc.) and gifts like scarves and wallets for personal use. How have you seen craft impact and/or improve the lives of the artisans that you work with? We’ve witnessed that the women we work with have become more confident. They are considered important for the earnings they bring in for their family. They’ve become decision makers whereas before they didn’t have much say in family issues. And they now have spending money to use on health and basic items for themselves and their children. Our biggest challenge has always been finding work for the artisans. Many depend financially on the funds they earn from Artisan Links. You have been working within this field for quite some time. Please tell me what you enjoy most about it. Their creativity! It amazes me how easily they create beautiful pieces and the pride they take in their work. Anything else you would like to add? Something special about this project that might surprise readers? This project has become a secure part of the artisans’ lives. They forget their worries when they attend the office and have a safe space to talk about personal issues with their colleagues. In many ways it keeps their minds away from the worries of life. It’s a refuge for all of us. Thanks to Raven & Lily for the beautiful images of the artisans! Get artisan resources, tips, inspiration, and free guides on ethical sourcing straight to your inbox!